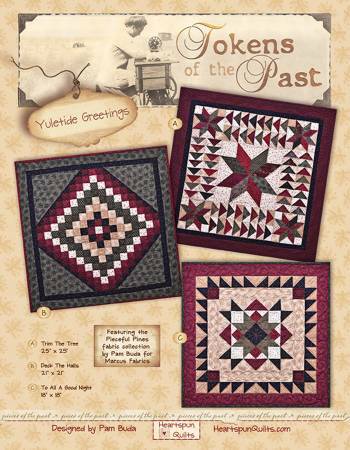 Tokens of the Past: Yuletide Greetings pattern by Pam Buda for Heartspun Quilts is used to make 3 table toppers featuring the Pieceful Pines fabric collection by Pam Buda for Marcus Fabrics. Pattern, Fabric to make all 3 toppers, and binding are included. Trim the Tree 25" x 25",Deck the Halls, 21" x 21", and to all a Good Night 18" x 18". KIT MAKES ALL 3 TOPPERS!